Whether you call it Human Resources, Talent Management, Human Capital Management, or any number of other terms and phrases, the systems you put in place to recruit, hire, onboard, compensate, track, train, and manage your employees from entrance to exit are all mission- critical elements to your company’s success. Powerful HR technologies are available to streamline, automate, and optimize your HR efforts. 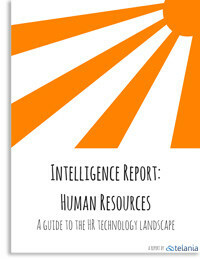 Telania conducted a survey in which hundreds of HR professionals provided information about their use of HR software. The results offer an eye-opening glimpse into the current state of HR software deployment in a range of companies. Download this exclusive report to make sure you stay ahead of the game and confidently participate in strategic discussions about the direction of your organization. For a limited time get premium access to this report – a $350 value free.